More than 40 years after President Nixon declared the War on Cancer in 1971, we are losing that battle. According to the American Cancer Society 1.67 million new cancer cases will be diagnosed in the U.S. in 2014. About 586,000 Americans and six million people worldwide will die of cancer in 2014. Despite massive investments in treatment and prevention, cancer mortality among people under 85 in the U.S. has fallen a meager 8% since 1975. This has led many to wonder if our current strategy makes sense. As Einstein once said, insanity is doing the same thing over and over again and expecting different results. Will the “cure” for cancer come from more blockbuster drugs, or is the answer much simpler and now within our grasp? Spending on cancer therapeutics is massive, with worldwide sales of $85 billion in 2013,1 and multiple drugs with $100,000 plus price tags on the market. However, on average, only a quarter of patients respond to any particular treatment—that’s a dismal response rate, and few of those are actual cures.2 This feverish focus on cures has dominated the research since President Nixon declared war on the disease in 1971. But the results are disheartening at best. 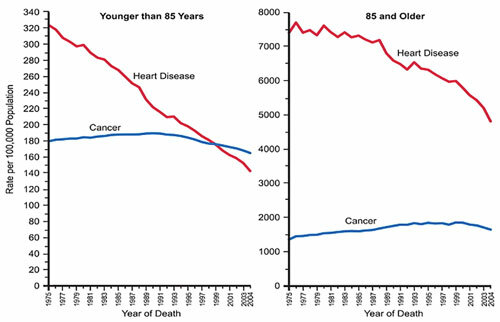 As shown in Figure 1, this approach has yielded meager results; as mentioned earlier, the overall cancer mortality rate in the U.S. for ages younger than 85 years has fallen by a meager 8% since 1975. Heart disease deaths by comparison have dropped a whopping 60% or so—many times more than cancer deaths. 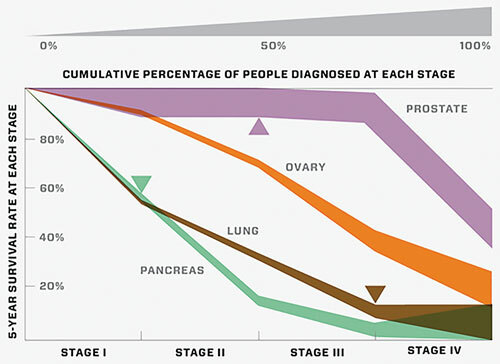 As shown in Figure 2, the survival rate for many cancers is similar. The trick is actually to find the disease early. Find it early, and the odds of survival approach 90% with most patients receiving just low-risk surgeries. But find the cancer late, in stage III or IV, and the only resort is treatment with toxic therapeutics and blasts of brutal radiation. Survival rates also drop precipitously. So it is very important to combat cancer with early detection and targeted cures based on active pathway of the cancer. We are so consumed by the quest to save the 586,000 Americans who will die from cancer that we overlook the staggering fact that more than one-third of all Americans, some 120 million people, will be diagnosed with cancer sometime in their lives. Shouldn’t we put as much energy into getting those 120 million people diagnosed early, as we put into curing as many as possible? This is where several promising, novel biomarkers that are on the horizon come into play. We are at a crucial juncture where we can actually fish promising biomarkers out of the blood instead of relying so much on tumor biopsies. This is game changing and will have a profound effect on patients and the industry at large. Some of these notable biomarkers are cell-free DNA (cfDNA), miRNAs, and exosomes. All of these can be sampled by noninvasive methods, and all demonstrate great promise as clinical biomarkers for cancer screening, prognosis, monitoring, and measuring a response to therapy. Cancer cells naturally release cfDNA as they undergo apoptosis and necrosis. The abundance of circulating cfDNA in blood (up to 100 billion fragments of DNA per mL), along with a short half-life (16.3 min) and noninvasive nature of the testing make them well-suited for cancer detection: cfDNA serves as a liquid biopsy via a simple blood draw rather than invasive biopsies and it is a workaround for the problem of intratumor heterogeneity (instead of getting a slice of a certain part of the tumor, you get a wider range of cell sample). Analysis of cfDNA can detect genetic and epigenetic alterations that indicate the presence of cancer and its progression. While cfDNA has been commercialized within the noninvasive prenatal testing (NIPT) market for a limited number of genes, research showing validity of measurement of cfDNA in cancer is still ongoing. Exosomes are nanovesicles, secreted by most cell types, containing a molecular fingerprint of the releasing cell type and of its status. They are released in easily accessible body fluids such as blood and urine making them valuable noninvasive biomarkers. As the analytical capabilities of NGS grow and cost goes down, it is poised to make the biggest near-term impact in clinical oncology. Interest is growing in applying NGS to measure these promising biomarkers for cancer diagnosis or disease and treatment monitoring. It’s important to note, however, that we are still in the early stages of figuring out how regulatory approval of clinical NGS tests will proceed. Assuming we cross that hurdle, we may have the chance to profoundly change how cancer is detected and how it is managed. The implications of this shift are a discussion for another article but needless to say it will cause a significant reorganization of industry and the medical establishment. In conclusion, moving cancer from a death sentence to a relatively curable disease requires taking a new approach. Using NGS detection of cfDNA and other promising biomarkers offers the greatest hope in transforming cancer care. If we can accelerate this field, it may not be long before we gauge our progress in the war on cancer not by the large number who die, but by how few barely have to fight at all. Harry Glorikian (harry@glorikian.com) is a senior executive, board director, and consultant in the life sciences/healthcare industry.